The top selling lot for Christies May 30th Hong Kong Magnificent Jewels Sale was none other than the Moussaieff Fancy Vivid Blue Ring. This breathtaking stone weighs 3.98 carats, was given a brilliant rectangular cut, and was graded with having a VVS2 clarity. The piece itself is a truly a work of art. The stone was embedded in a size 5 pink gold ring, surrounded by 4 rectangular, and 10 cushion cut pink diamonds. The upper half of the ring’s hoop is adorned with baguette cut pink diamonds. The lot went on to yield a respectable $8.8 million (surpassing its low pre-auction estimate of $8.26 million). If you want to learn more about other noteworthy lots, check out our article here. This year’s Argyle Tender managed to outdo itself once more with its five Hero diamonds labeled as ‘The Custodians Of Rare Beauty.’ Out of these remarkable pieces one stone truly stands out; the Argyle Everglow, also known as the largest red diamond ever to be offered by the Argyle mine. Weighing in at 2.11 carats, this mesmerizing red diamond has been certified by the Gemological Institute of America (GIA) as a radiant cut, VS2 Clarity, Fancy Red. This stone however is not only important due to its weight. 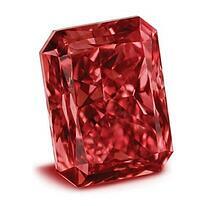 Red stones are extremely rare (the rarest of all colored diamonds in fact), and in a history of Tenders that spans over 30 years, only 20 carats worth of red diamonds have ever been offered. It is therefore safe to assume that the combination of color, size, and craftsmanship of this gem can easily make it rank among the most important diamonds in history. While the price for this stone has not been disclosed, its importance makes it safe to assume that it yielded a very respectable tag. If you would like to read more about this year’s tender, and see the diamonds presented alongside the Argyle Everglow, click here. The “Apollo Blue” and “Artemis Pink” diamonds are two magnificent pieces that couldn’t possibly be missing from our list. These two stones were les pièce de résistance of Sotheby’s spring Geneva sale of “Magnificent Jewels and Noble Jewels” in May. The Apollo Blue is a pear cut, internally flawless Fancy Vivid Blue stone, with an IIb grading by the GIA. Weighing in at 14.54 carats, it is the largest Fancy Vivid Blue diamond ever to be sold at an auction. Setting records didn’t stop there however. Yielding a very respectable $42.1 million (approximately $2.9 million per carat) the Apollo Blue also broke the record for most expensive earring sold at an auction up to date. Coupled with the Apollo, the Artemis Pink is a 16 carat, pear-cut, IIa, Fancy Intense Purplish Pink diamond that managed to fetch $13.2 million. Yielding $1.88 million per carat meant that this gem too was a record holder, setting a new benchmark for highest price per carat paid for a Fancy Intense Purplish Pink diamond at an auction. Despite being sold as two different lots, together these two stones are in a league of their own, fetching over $57 million and becoming the most expensive pair of earrings to ever be sold at an auction. Both of the pieces were purchased by the same buyer (whose name has not been revealed) who would ultimately have their names changed from Apollo Blue and Artemis Pink to "The Memory of Autumn Leaves" and "The Dream of Autumn Leaves" respectively. 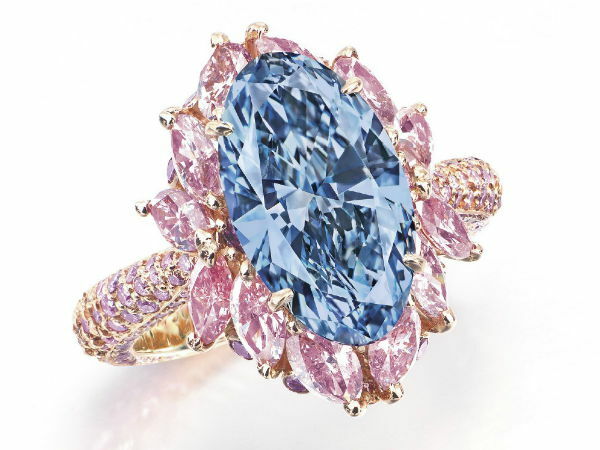 The Sotheby’s Magnificent Jewels and Jadeite Spring Sale hosted during April will perhaps leave its mark in history as it hosted the sale of the most valuable colored diamond of all time, the Pink Star. Weighing in at 59.60 carats, this gem has a truly magnificent oval-mixed cut, and is considered by the GIA to be of Fancy Vivid Pink, Internally Flawless hue and clarity. The price for this masterpiece? An astounding $71.2 million (greatly exceeding its $60 million pre-auction estimate) offered by renowned Hong Kong Jewelry Retailer Chow Tai Fook. 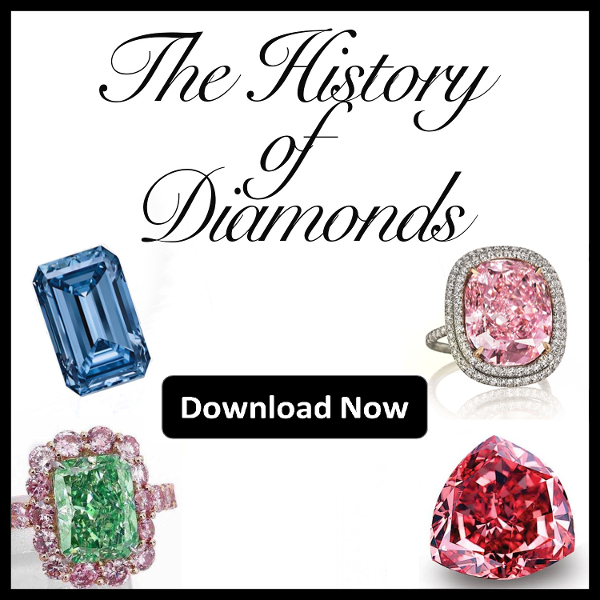 With this jaw dropping figure the Pink Star managed to dethrone not one but two elite diamonds; the Oppenheimer Blue (previous record holder for most valuable diamond of all time) and the Graff Pink (previous record holder for most expensive pink diamond ever to be sold at an auction). The next diamond on our list is perhaps the most mysterious. Being fairly new (discovered in 2015), not much is known about this stone, including its origin, its owner, and the cutter responsible for transforming it into its mesmerizing current form. Today the gem stands as a 37.30 carat cushion-modified brilliant cut, Fancy Intense Pink masterpiece and has managed to astound not only Sotheby’s chairmen, but even gemologists who studied it at the GIA. To quote David Bennet, worldwide chairman of Sotheby's International Jewellery Division said: "The discovery of any pink diamond is exceptional, but The Raj Pink's remarkable size and intensity of color places it in the rarefied company of the most important pink diamonds known." For more information on this diamond check out our article here. "The Pink Promise" a worthy name given because of the fruition of its owners promise to transform this stone to its current breathtaking state. 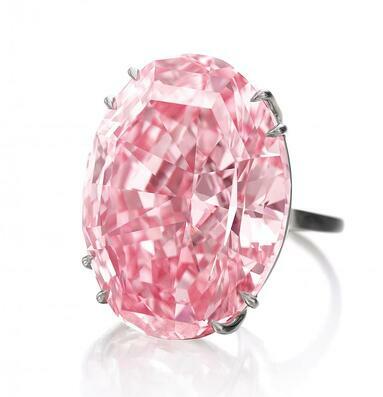 Considered to be the “Picasso of Pink Diamonds” this oval mixed cut, type II, VVS1,14.93 carat diamond was given the highest possible color grading a pink diamond can achieve (Fancy Vivid Pink). by the GIA. This masterpiece was sold during Christie's November Auction fetching an astounding $31.86 million, translating to $2.13 per carat. This meant that the Pink Promise had just fallen short of achieving a price per carat record for a pink diamond. 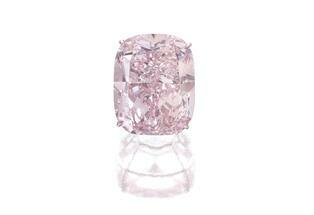 Currently the record is held by the Vivid Pink reighing supreme at $2.16 per carat since its sale back it 2009. Stay tuned as we will be releasing an article covering even more details about this diamond's origins and transformation in early 2018. Finally but certainly not least, we felt the need to include the colorless giant Lesedi La Rona to the list of best diamonds of this year. Thought to be approximately 2.5 billion years old, this rare type lla stone was discovered in November of 2015 at The Karowe Diamond Mine in Botswana. 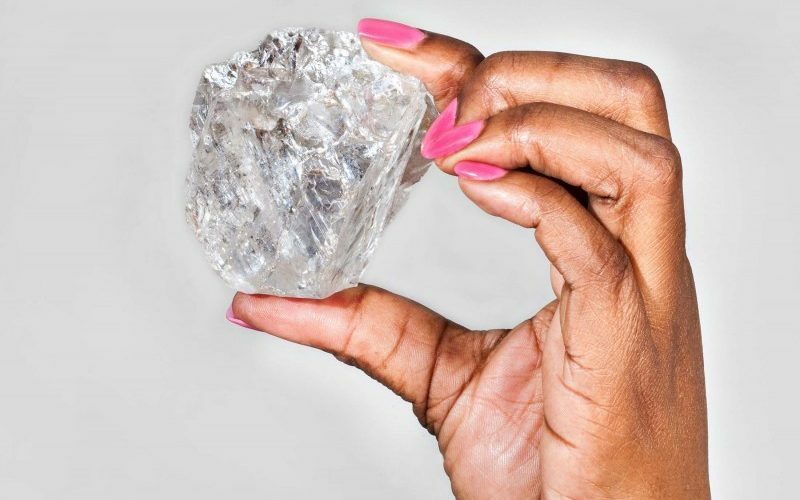 Currently it stands at a massive 1109 carat rough, and is the second largest colorless diamond in the world, right after the Cullinan. Today the Lesedi La Rona is owned by Laurence Graff, who was able to attain it after bidding a very respectable $53 million in this year’s Sotheby’s September auction. While the future of this stone is unknown, one thing is for certain; it is now in very capable hands, and we are all looking forward to seeing how Graff will be able to reveal the stone’s true inner beauty. To learn more about this stone check out our article here. And there you have it, our 6 favorite diamonds of 2017. Are there any we missed? Which was your favorite? Let us know. And as always feel free to follow us on Twitter and like us on Facebook.